Strictly Come Dancing properly kicked off its latest series tonight as the 15 new couples took to the ballroom for the first time. There’s no elimination this weekend, which means all of the couples will go straight through to week 2. The scores they get tonight will be added to next week’s before the public vote opens. The couples have had two weeks to train since being paired up so tonight gave us a feel for who is going to be good and who might need to put in some extra hours. Danny had the daunting task of opening the series with his and Amy’s Foxtrot to Top Cat Theme by Hoyt Curtin. In training Danny spoke about Amy’s disciplined approach to training, but also struggled with his frame. However, the other celebrities seemed impressed, so would they deliver a stellar performance? The dance: Clad in a bright pink suit and leopard print shirt, Danny strutted down the stairs solo before teaming up with Amy. It was a light, bright, playful routine with plenty of spins, kicks and balletic leaps. He did have a little wobble towards the end but overall it was a sparkling dance and a great start to the show. The comments: Shirley said it was ‘outstanding’ and that Danny had a beautiful shoulder line, but the feet needed work. Bruno praised Danny’s showmanship and jazzy touches, as well as the imagination of the routine, but warned him against tightening up. Craig said it could have been smoother and lacked swing and sway but that Danny had great timing and musicality. Darcey liked Danny’s agility and flair and said he had clean neat feet, calling him ‘one to watch’. For their first dance, Kate and her partner Aljaz performed a Cha Cha Cha to Kiss by Tom Jones. In training Kate said she was looking forward to everything about the Strictly experience and how pleased she was to get Aljaz as her partner. They also visited the BBC newsroom – but would their performance be newsworthy too? The dance: Starting her routine behind a news desk, Kate showed plenty of sass as she and Aljaz slinked around the Strictly dancefloor. The routine was a little heavy in places and she lost her posture a couple of times, but she had decent hip action and it’s clear that she’s having a lot of fun. The comments: Bruno called Kate ‘a saucy minx’ and that both she and the audience enjoyed, but it wasn’t technically perfect and to focus on her timing. Craig said there was a lot of stamping and Kate needed straighter legs, although her personality shone through. Darcey said Kate sold it and had ‘extraordinary’ performance value, whilst Shirley thought it lacked consistency and wanted to see more rotation in the body but that Kate showed a lot of promise. Paralympian triathlete Lauren and her partner AJ kicked off their Strictly journey with a Waltz to I’m Kissing You by Des’ree. In training Lauren spoke about the struggle of balancing dance training with competing in the World Championships in Australia, where she won a gold medal. AJ surprised her at the airport before they began training, but would their lack of time together affect their performance? The dance: Lauren practically floated across the floor in her dreamy and romantic performance. She was light on her feet and had lovely posture throughout, as well as showing off some great spins (including one particularly dramatic one towards the end). The drag looked a little heavy but otherwise this was a very strong first routine. The comments: Craig said Lauren’s left shoulder was raised but the routine was ‘impressive’. Darcey liked Lauren’s control and serenity but wanted her to think of her back in hold. Shirley praised their chemistry but wanted Lauren to work on her footwork, whilst Bruno called it ‘floaty, fluid and romantic’. For their first routine, Seann and Katya performed a Tango to SexyBack by Justin Timberlake, with Seann playing a bodyguard. In training, Seann spoke about how difficult he was finding things and also took Katya to see him perform at a comedy gig, where they showcased a little of their routine. The dance: Oh, Seann. His shoulders were hunched, his hands were spatulistic and it was very skippy in places. That said, he had some sharp kicks and flicks, there was a spectacular leap towards the end and it was clear that he was getting into the performance. Not the strongest start but he seemed to enjoy it and I’ll be intrigued to see what he does next week. The comments: Darcey said it was a fierce performance, whilst Shirley criticised the lift but praised Seann’s heel leads. Bruno liked the attack, passion and power but wanted more control. Craig thought Seann was man-handling Katya and that it lacked sophistication. Radio DJ Vick and new professional Graziano performed the first Jive of the series, dancing to Feel It Still by Portugal. The Man. In training Graziano surprised Vick at her job as a breakfast DJ, whilst Vick called dancing ‘one of the scariest things I’ve ever done’ but spoke about wanting to be pushed. The dance: This was a high-energy, bouncy jive with plenty of kicks, flicks and tricks – particularly Vick catching Graziano towards the end! Vick was light on her feet throughout, with good hip action, decent armography and tons of personality. For me something about it didn’t quite catch fire but it was a decent first dance all in all. The comments: Shirley said it was a little discombobulated but that Vick has potential. Bruno praised Vick for keeping up and said she had good timing, but wanted more precision. Craig said it was messy and laboured and all about Graziano. Darcey thought Vick found the speed challenging but said she had plenty of promise. 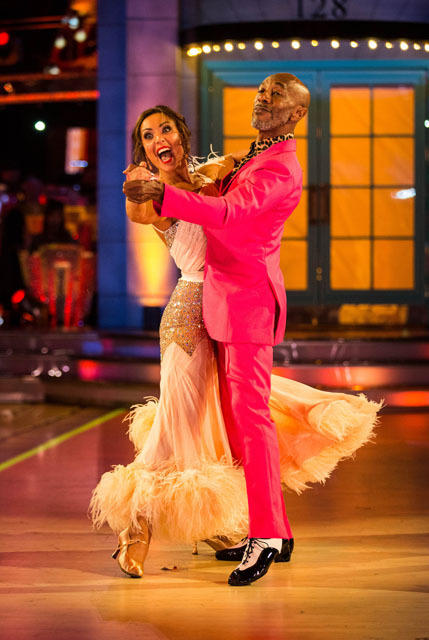 For their first dance, Susannah and Anton performed a Samba to Tico Tico by Carmen Miranda. It’s a difficult dance for week one, so could the pair of them pull it off? In training, Susannah spoke about her difficulties with the routine but how much she was enjoying working with Anton and being quietly confident about her routine. The dance: The performance kicked off with Anton emerging from beneath Susannah’s huge skirt, and unfortunately that was the highlight of the routine for me. She lacked hip action, the footwork didn’t have enough weight behind it and it was all a bit precarious. This wasn’t a great first routine and I fear it might mean she’s the first to leave. The comments: Bruno said ‘thank God it’s over’. Craig felt Susannah was staggering about and the best part was her falling on the floor. Darcey said she knew there’s a dancer in Susannah and wanted to see more of that. Shirley thought the nerves got the better of Susannah but told her to keep pushing. Casualty star Charles may be an on-screen heartthrob, but would his and Karen’s Cha Cha Cha to Ain’t No Love (Ain’t No Us) by Sub Sub featuring Melanie Williams get pulses racing or simply flatline? In training Charles found the technical elements of the dance alien, so to see him in his comfort zone Karen visited him on the Casualty set and they gave his co-stars a sneak preview of the routine. The dance: Charles delivered a great performance. He was sharp and precise, had great hip action, straight legs throughout and excellent timing, as well as bucketloads of confidence. I think he could be a real potential dark horse in this competition and I’m already looking forward to seeing what he can do with a Ballroom routine. The comments: Craig said Charles’ hips were a little tight but liked his confidence. Darcey called him ‘watchable’ and praised his attitude and rhythm. Shirley said Charles had swag but that it was a ‘disco’ routine. Bruno, on the other hand, said it was ‘red hot and smouldering. Former Pussycat Doll Ashley was one of the early favourites for this year’s Strictly Come Dancing trophy, but would her and Pasha’s Viennese Waltz to Perfect by Ed Sheeran featuring Beyonce send them to the top of the leaderboard? In training Ashley spoke about how much she enjoyed the launch show and working with Pasha, but also her worries about the expectations on her and the complexity of the steps. The dance: What a gorgeous first routine from Ashley. She had beautiful movement across the floor, lovely arms throughout and excellent control in her spins. There was a real fluidity about her performance and it’s clear she’s got great chemistry with Pasha. For me she’s definitely the leader currently and it’s clear why she’s already been labelled as a frontrunner. The comments: Darcey said Ashley was graceful and liked how she filled out the music and used her back, but that she lost her frame in the rotations. Shirley praised Ashley’s musicality and footwork yet wanted her to keep her centre up. Bruno liked Ashley’s spatial awareness and storytelling, whilst Craig said there was too much rise and fall but enjoyed Ashley’s expression. 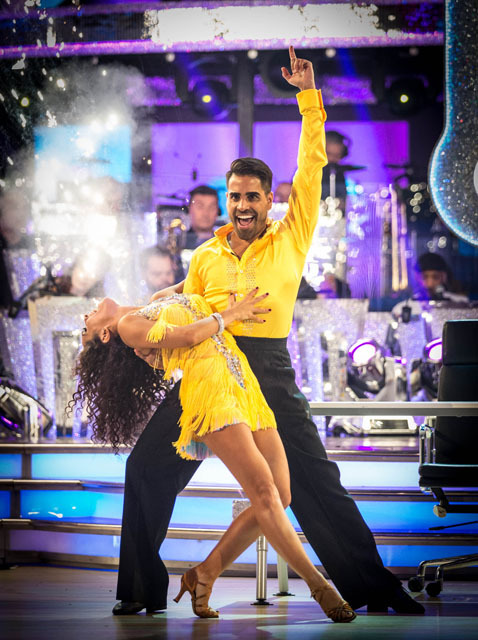 Dr Ranj and Janette’s first dance was a Cha Cha Cha to Whitney Houston’s How Will I Know. In training, Ranj spoke about there being a lot to learn and took Janette to watch him at work on This Morning, before showing off some of his dance to presenters Philip Schofield and Holly Willoughby. 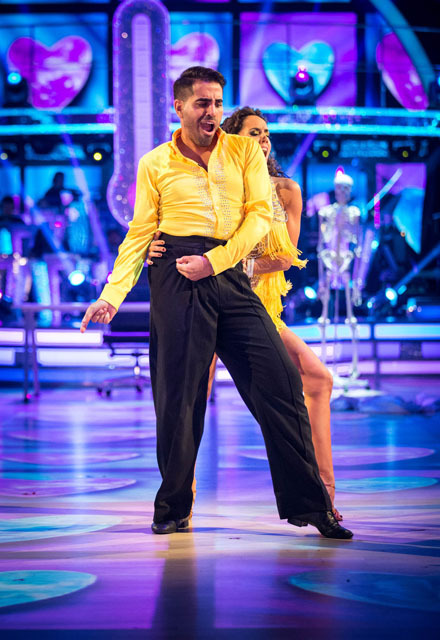 The dance: Dr Ranj started the dance in his doctor’s coat before stripping off to reveal a bright yellow shirt. He had a huge grin on his face throughout and lovely lightness on his feet, as well as excellent arm movements, plenty of energy and good timing. Personally I would have liked a little more hip action, but it was a lot of fun to watch and he’s already one of my favourites in terms of performance and entertainment value. The comments: Shirley gave the dance a standing ovation and said it was fun and light. Bruno said Dr Ranj burst onto the scene and the dance was crisp. Craig loved it, whilst Darcey said the routine was clean and tight and that Dr Ranj would go far. 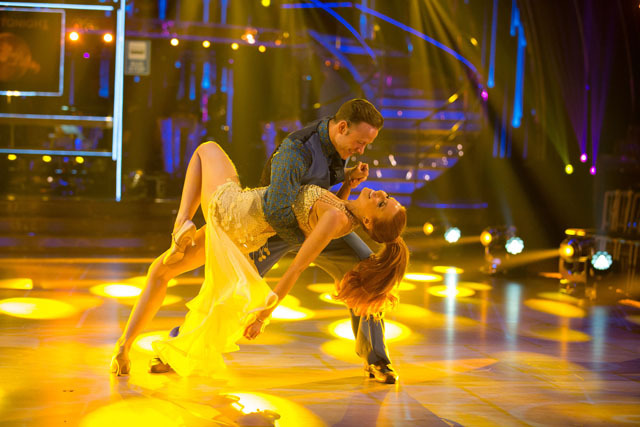 TV presenter Katie and her partner Gorka’s debut routine was a Waltz to When We Were Young by Adele. In training Katie spoke about her desire for Gorka to boost her confidence and wanting to make her parents proud, as well as dealing with her limitations from her scarring and wanting to improve through training hard. The dance: Although Katie’s shoulders were a little tense throughout, this was definitely a promising start from her. She moved well across the floor, had nice rise and fall and I liked the relationship between her and Gorka. There were a couple of stumbles but hopefully that can be put down to nerves and overall the quality of the routine should be enough to see her through. The comments: Bruno told Katie not to overthink and just go with it, whilst Craig said she had questionable balance but liked her arm placement. Darcey thought Katie hid her nerves well and hit some nice lines yet wanted her to think about narrative. Shirley told Katie she showed great promise and had a nice frame, but wanted her to come out like it was a practice session. 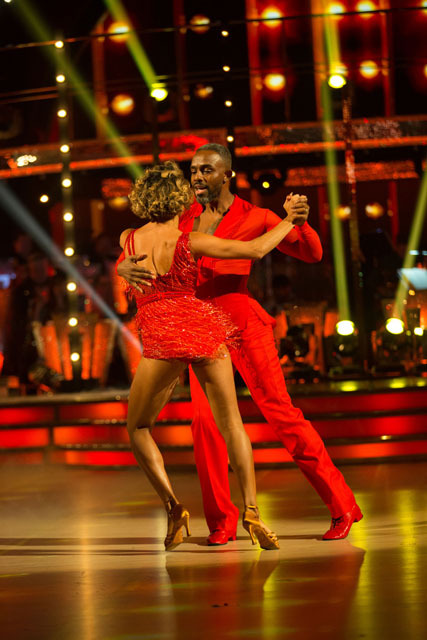 We know Graeme Swann as a keen spin bowler, but would his and Oti’s Samba to Soul Limbo by Booker T and the MGs (AKA the Test Match Special theme tune) hit the judges for six? In training, Graeme spoke about being excited to have Oti as a partner before taking her to the Trent Bridge cricket ground for a lesson in batting. 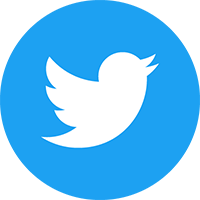 The dance: After an announcement from fellow TMS presenter Jonathan Agnew, Graeme descended from the studio ceiling on a giant cricket bat before beginning his Samba. It was a little all over the place, but his hip action and footwork were both decent enough and it was clear that he was enjoying himself. I’d like a bit more polish in future weeks but for a first – and not easy – dance he made a decent fist of it and it was definitely entertaining to watch. The comments: Craig said Graeme’s hands were wooden and his hips were awkward but liked his energy. Darcey said he had exceptional rhythm but wanted him to finish his hands. Shirley thought Graeme’s basic skills were impressive and liked his personality, whilst Bruno said he’d be top of the bill at every hen do in the country due to his hip action. Stacey and Kevin became the first couple ever to perform a Quickstep in week one with their routine to Kylie Minogue’s Dancing. In training Stacey spoke about being happy to get Kevin as her partner and wanting to have fun, as well as needing to up her fitness levels before the performance. The dance: This was a routine with a lot of flair and fun, with Stacey showing off her lightness on her feet and plenty of personality. She and Kevin flew across the Strictly ballroom floor and had good timing, but you could have driven a bus through their gapping in hold. Overall it was a solid first performance but there’s definitely things to build on for the future. The comments: Darcey said Stacey was a delight and there was plenty of content, but it got messy in places and she needed to keep her top line. Shirley liked the light, clean footwork but said Stacey needed a stronger core. Bruno called her ‘sprinty Stacey’, but wanted her to be careful not to let her enthusiasm get the better of her. Craig thought it was a bit floppy yet enjoyed every minute. Former Blue star Lee and his partner Nadiya’s first performance on Strictly was a Waltz to Take It To The Limit by The Eagles. In training Lee struggled with Nadiya’s discplined approach and also checked up on Seann and Katya who were training next door, as well as how much he wanted to get out there and perform. The dance: This was an OK start for Lee, who showed confidence throughout. 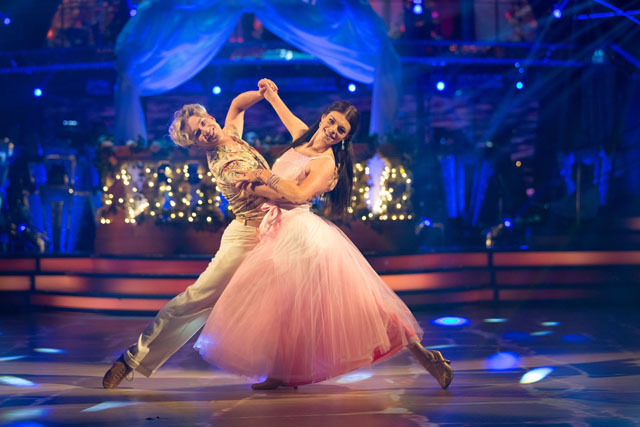 It was definitely a more dramatic Waltz than I expected, and whilst he was a bit too much in his knees at times he moved nicely across the floor and had good control in the spins. It wasn’t perfect by any means, but he acted it well and showed that he’s definitely got a chance of being there at the end of the competition. The comments: Shirley said she felt the chemistry and that Lee recovered nicely from his slip, but the footwork needed attention and he went a little ahead of the music. Bruno praised Lee’s confidence in leading, whilst Craig wanted more rise and fall in the feet and drive in the heel leads. Darcey thought it felt a little lustful but that once Lee got started he presented Nadiya very well and it was a caring performance. Social media star Joe and his partner Dianne gave us the second Jive of Strictly Come Dancing 2018 with their routine to 80s classic Take On Me by A-ha. In training Joe spoke about wanting to include Dianne in some of his videos – including pranking her with some cardboard boxes – as well as getting the jive action and looking as cool as possible. The dance: Joe had bags of energy and sharp kicks and flicks, although they were a little scattergun in places. 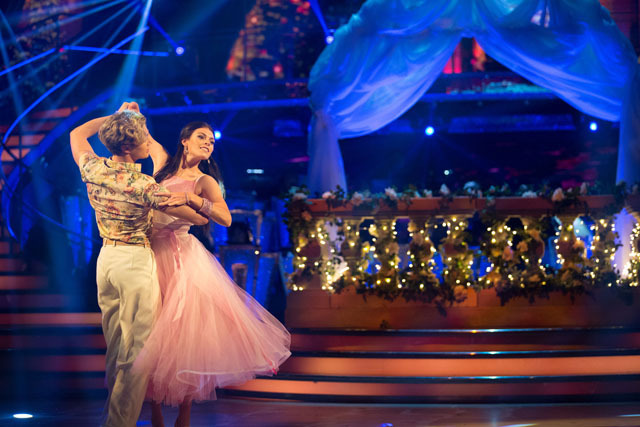 Whilst some of the tricks didn’t quite work, it was clear he and Dianne are really enjoying performing together and they had good synchronicity. It’s a promising start for him and hopefully something he can build on next week with his Ballroom. The comments: Bruno likened Joe to a ‘jet-propelled grasshopper’ and said he was the biggest surprise of the night. Craig said the routine changed his view of Joe completely, whilst Darcey said there was lots of attack and great stamina. Shirley said Joe’s grandma could be proud and praised his swivel action. Last but not least to dance were Faye and Giovanni. She certainly knows her way around a dance routine, but would all her steps be in the right order in their Cha Cha Cha to Lullaby by Sigala featuring Paloma Faith? In training Faye spoke about how much she’s loved the Strictly experience so far and trying to shut out the distractions of the studio when performing. The dance: Faye started her dance in front of the judges’ desk before getting into hold with Giovanni. She had good straight legs throughout, nice hip action and fluid, crisp arm movements, as well as a great sense of fun that made her joyous to watch. I liked that she threw in a few of her Steps moves too! It was a great ending to the show and showed why she’s one of the favourites to win the competition. The comments: Craig said it was worth the wait and by no means a tragedy, but wanted Faye to fix her hip action. Darcey called it a wonderful way to finish the night and loved the clean dynamic finishes and speed, whilst Shirley thought Faye had great promise but wanted her to learn the right leg actions. Bruno thought it was clear and polished with plenty of sparkle.